This mural is part of an exhibit of historically-inspired street art organized by the Icon Factory, an artists’ collective in Dublin. The food in Ireland has gone far beyond the overcooked and tasteless shepherd’s pies and stews of the past. We found wonderfully fresh vegetables carefully prepared along with delicious fish and seafood and deeply flavorful meats. Here are my impressions, organized by city. Pig’s Ear (4 Nassau Street, Dublin 2; 670-3865; web: http://www.thepigsear.ie/our-food-wine/). This restaurant overlooks the wooded part of Trinity College’s campus. Their soups are deeply flavored. The crab salad is light and lets the fresh crab shine through. Their lamb has great flavor and the vegetables and sauces served on the plate offer a thoughtful combination of tastes. The service is friendly but slow. The wait staff but not the chefs seemed a bit overwhelmed by the full house. 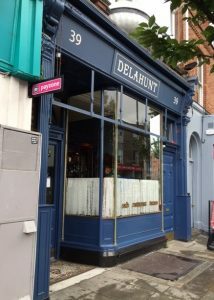 Delahunt (39 Camden St Lower) serves delicious dishes that combine outstandingly fresh fish and vegetables in interesting ways with delicate sauces. Their meat dishes are deeply flavorful as well. We especially liked appetizers of gazpacho with crab salad and an amazing fresh asparagus salad with a duck egg. Main courses of lamb with chanterelles and grilled lettuce, and a vegetarian dish of potato gnocchi with vegetables combined in a light sauce, were delicious. The restaurant is in an inviting setting with skilled and friendly wait staff. Etto (18 Marion Row, Dublin 2, phone: 678-8872; Website: www.etto.ie). A small, charming, but fairly noisy room, with friendly capable service. The food combines excellent Irish ingredients with skilled and delicate cooking. Outstandingly fresh \mussels were served in a deeply flavorful sauce that combined very little cream with mussel broth, micro vegetables and a hint of pepper. Their meats are local and tasty and paired with sauces that bring out the flavors of the meat and accompanying vegetables. A small but well-chosen wine list accompanies the meal. Pichet (15 Trinity St, phone 677-1060). Pichet bills itself as a French bistro, and for the most part that is what Pichet is. They transform French classics with Irish ingredients and contemporary techniques from Europe and the US. An excellent risotto with smoked haddock is exemplary of their approach. Pichet is about 20% more expensive than Delahunt, but slightly less accomplished and interesting in their cooking. Nevertheless, this is a fine restaurant in a central location with a friendly and helpful staff. Paradiso, where we both stayed and ate in Cork. Fish Shack (2 Parliament St, Temple Bar) offers fresh seafood, which unfortunately was overcooked. Their fish chowder however was wonderful. This is a fun place to eat with charming and helpful staff, and is less expensive than the others we ate at in Dublin. 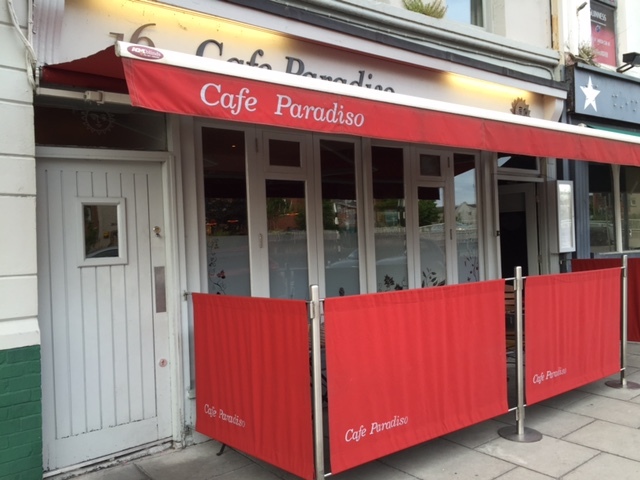 Café Paradiso (16 Lancaster Quay, phone: 021-427-7939). This vegetarian restaurant uses wonderfully fresh local ingredients and prepares them in interesting ways. Appetizers bring out the depth of flavor in vegetables, as in a roasted beet salad with two cheeses and fruit sauces. We especially enjoyed nettle raviolis with asparagus and a pea sauce and a couscous with vegetables and a deeply flavorful tomato sauce that could be mixed with yogurt and a somewhat spicy sauce. Desserts are less interesting. Paradiso is also an inn that offers two rooms upstairs from the restaurant. If you can get them, these are pleasant and well located in this charming small city. Fishy Fishy (Piers Road, 21-470-0415). This is the ideal of a seaside seafood restaurant. The oysters are wonderfully fresh and briny. Their fish chowder is among the best we have ever eaten anywhere in the world. 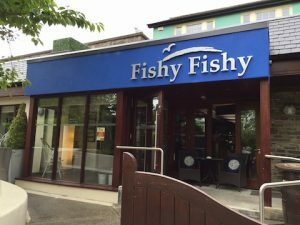 Main dishes are not especially adventurous but showcase super-fresh fish and shellfish. Aniar (53 Lower Dominick Street; phone 091-535-947) This Michelin starred restaurant is committed to using only local ingredients. If something can’t be found in Ireland, it is not on the menu. The chef and his suppliers forage on land and sea. That means super fresh herbs, vegetables and fruits, and fish, but also clever and delicious substitutes for sugar, lemon and other tropical items that are not local. Seaweed is used in many of the dishes to wonderful effect. The combinations within each dish are carefully thought out to bring out the flavors of the main ingredients but also to create unusual taste combinations. This is a menu that you can think about or you can just sit back and let the tastes wash over you with delight. The courses link together well. The wine selection is excellent, and since the sommelier works hard to find small producers he is able to bring in outstanding wines at reasonable cost. Diners have a choice of three tasting menus of 8, 10 or 12 courses. We found 8 courses left us filled but not overstuffed. There are wine pairings with each menu or one can select (or better let the sommelier select) a couple of glasses. 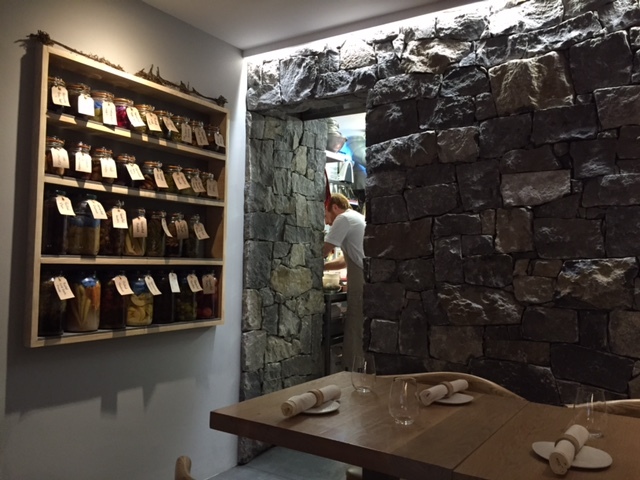 Inside Aniar, a Michelin-starred restaurant in Galway. Eat at Massimo (10 William St. West; phone 091-582-239). This is an informal gastro pub from the same chef as Aniar. The dishes are simple but very well prepared: various beef, lamb and pork burgers with interesting combinations of cheese and relishes, simple but well prepared fish dishes, and fresh salads. A fun, inexpensive spot for brunch, lunch, dinner and late night. Sheridans Cheesemongers (14-16 Churchyard Street). Downstairs this is a cheese store with a wide selection of properly-aged cheese from Ireland and elsewhere in Europe; upstairs is a wine bar where you can get cheese or charcuterie platters that are served with delicious bread, wonderful in-house made chutney and olives. The wine bar, not surprisingly, also has a good selection of wines by the glass and a wider selection of bottles that all are fairly if not cheaply priced. The wine bar is open 7 days a week from 1pm to midnight. An excellent choice for a quick and inexpensive lunch, dinner or snack, the wine bar is a friendly spot that is happy to let you linger as long as you want.